You really can't beat a weekend away in the Hunter Valley. Only a short two hours drive away from Sydney metro and you find a little patch of paradise called Bistro Molines. This lovely restaurant is located amongst the picturesque valley of the Tallavera Grove Vines at Mount View, NSW. Surrounded by undulating mountains and rows of Vineyards, the view takes your breath away. When entering the open courtyard with a tasting cellar door one side and a french provincial-style country house on the other, you may be forgiven for thinking you are in France. Owners Robert and Sally Molines have a long history in the Hunter Valley. Opening their first restaurant at Happy Valley Winery in 1973 then later the popular Cellar Restaurant at Hungerford Hill. Another success with Pepper Tree Winery. Moving onto achieving further delights working at the French Bistro at Margans old cellar door at Beltree. Some travelling in France then finally home to open Bistro Molines at Tallavera Grove in 2008. 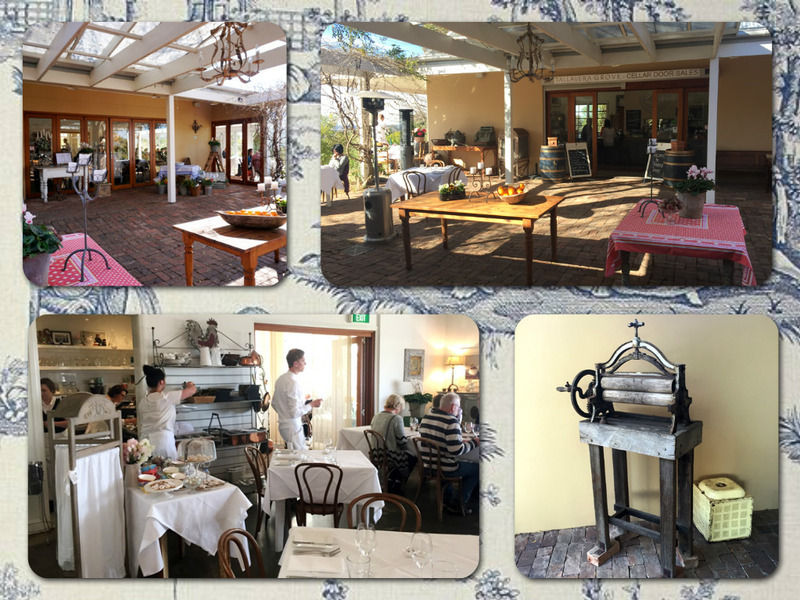 The restaurant has seating options either outside in the glorious courtyard or inside amongst the french country decor overlooking the lush Tallavera Grove Vineyards. Dining at Bistro Molines has long been on my wish list. The restaurant is highly acclaimed and has been awarded a Chef's hat for the sixth straight year in a row. Chef Robert Molines is well known for creating outstanding regional dishes with a refined symphony of flavours that leave a lasting impression of his greatness. My mouth was drooling in anticipation. It was my birthday weekend and I was so excited to finally be seated at this restaurant that many friends had recommended. The weather was perfect and so was the location of our table. Robert's lovely wife and restaurant manager Sally explained the menu and took our wine order. I personally love to venture out and try food I don't generally have every day. I almost felt the earth breath and imagined chickens scratching the soil when presented with the menu. Anything created with a diversity of fresh ingredients and embracing the traditional country nose to tail cuisine often wins my favour. On the menu you can find Quails, Sheep's brains, Kidneys, Rabbit, Venison and of course the quintessentially French dish, Escargots. Of course, some will turn their noses up at escargots but I enjoy their texture which to me is more like chicken liver, or even mushrooms but it always screams French. Everyone should try them at least once in their lifetime. Robert sources his escargots (farmed garden snails) from a local producer in the region. escargots tend to carry a rich sauce very well and if made right aren't overpowering. Most escargot dishes are drenched in a sizzling garlic and wine butter. Many people don't realise that snails carry a high protein content, though that's only if not overly drenched in butter. What the heck, French food is about flavour and they love their butter. Bring it on! To tempt our taste buds, we were served a complimentary canapé. A little delicate puff filled with a delicious warm gooey cheese. It went perfectly with our starter glass of Pinot Gris. Of course, for my entree I ordered Vol Au Vent of Escargots à la Bourguignonne with mushrooms, speck and red wine sauce. My partner ordered the Seared Yellow Fin Tuna Carpaccio 'Nicoise' tomato vinaigrette. My escargots were delicious served in a crispy puff pastry Vol Au Vent. They were drenched in the classic french Bourguignonne sauce served with fresh garden peas, mushrooms, mini baby carrots and speck. The sauce wasn't overpowering in flavour. The snails were almost crunchy in texture with the fresh just cooked vegetables. I could taste the butter, red wine, garlic,chervil and diced speck. 5 stars! I just by chance found this video on the internet of Robert cooking escargot. Check out this link and drool. I'm lucky my partner loves me, as I always steal a taste of his food. The Yellow Fin Tuna melted in my mouth, displayed like a colourful work of Art - it screamed fresh, lean and clean. We ordered a Carriages Shiraz to go with our mains. The wine list is impressive and also has some limited releases featuring on Robert's personal recommendation list. In my choice of main, I followed my desire to eat from the land. I tried not to think of precious Bambi while I ordered the Venison special. I love animals with a passion but I also love my food and do believe my teeth were meant for meat. My partner ordered Veal wrapped in prosciutto with roasted Jerusalem artichokes, cavolo nero, champignon sauce, sprinkled with parmesan. I can't remember exactly what the venison description on the special menu said, but I was delighted the meat wasn't gamey at all. The sauce was a sweeter bourguignon style and the meat was tender and ever so lean. I was in heaven with this amazing food, company and view. Out came my partner's veal. Again I had to steal a morsel even though he was quite reluctant to part with his treasured meat. I also couldn't fault this dish, so tender and subtle in taste, the sauce complimented perfectly with the sprigs of cavolo nero breaking up the tasty sauce. We chatted with Sally and though we were busting at the sides, we ordered a dessert to share. During our conversation, we learned that Robert and Sally also own 60 acres of Vineyards in Pokolbin. Of course, we were offered a choice of red or white wine from their Vineyard. We knew after one sip, we should have ordered this delicious wine instead of the Carriages Shiraz which was slightly heavier. Out came my birthday dessert with a surprise sparkler. Toasted marshmallow, fresh pineapple, meringue and coconut snow. Oh my! how delicious it was. The only thing you need to top off your visit to the Hunter Valley is some accommodation. We had already booked ours elsewhere not knowing that Sally and Robert also offer a lovely Cottage on the grounds. Sally has created a lovely haven for people to stay overlooking the Vineyards. Also as I'm a dog lover, Sally mentioned that if we ever wanted to get away again, we were welcome to bring our dogs too. She won me! We couldn't go inside as someone had already booked for the weekend. We took a sneaky peek as we walked past. The grounds are totally stunning. What a little paradise. Every direction we looked the view was gorgeous. I easily see myself staying for a weekend here. As if this wasn't enough, to top it off you can do wine tastings at Tallavera Grove Cellar Door just opposite Bistro Molines just 2 minutes walk from the Cottage. This has been a perfect birthday lunch and an excellent start to our Hunter Valley weekend. I highly recommend you get away early one Friday and enjoy a superb lunch at Bistro Moline enjoying the outstanding food, views and service. Maybe even stay the whole weekend in the gorgeous Little Orchard Cottage. Total bliss! We had the pleasure of attending a wedding here andit was a truly beautiful event. There are some stunning photos in your article - thank you for sharing.